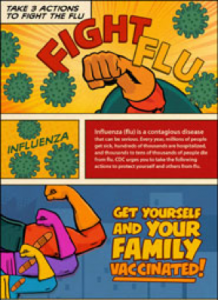 Influenza: it’s not to be sniffed at. We’ve all heard of flu but do we really know just how serious it can be? In our busy lives, becoming unwell is often unavoidable – though, thankfully, not always. Winter brings with it an array of ailments we’ve grown used to dealing with: it’s totally realistic to be worried about our businesses being affected if we are struck down with something ourselves, be concerned about our child’s potentially increased absence from school or be dreading the thought of taking time off work to nurse poorly children at this time of year. Influenza (or flu) is one of these extremely common ailments. As the NHS braces itself for one of the most severe flu seasons yet, we would all benefit from reminding ourselves exactly what flu is, how to spot the signs and symptoms and, even more importantly, how to help prevent it from becoming an issue in the first place. What is flu, though? Isn’t it ‘just a cold’? This is a question we hear all the time! Unfortunately, it’s not ‘just a cold’. Admittedly, flu can start off with similar symptoms to the common cold but can very quickly escalate into something much more unsavoury, with the very real possibility of becoming potentially fatal. It is actually a highly infectious disease caused by a virus which can cause serious complications, even in previously healthy people. Flu is the cause of tens of thousands of hospital visits and hundreds of thousands of GP visits every year, causing massive strain on our already overstretched NHS, along with massive strain on our already busy, complicated lives. So, what are the symptoms of flu? A very sudden, high temperature of 38 degrees or above. Aching muscles, with pain in your limbs or joints. Muscle aches, pain, tiredness and general weakness. As if this isn’t bad enough, sufferers can rapidly develop much more serious – even fatal – complications. A bacterial chest infection leading to pneumonia is the most common, though there are others such as middle ear infections, meningitis (inflammation of the covering of the brain), septic shock (a severe and life threating infection of the whole body) and encephalitis (inflammation of the brain). These complications may seem shocking and, indeed, extremely rare to those of us with limited knowledge of the infection. However, it is estimated that there are around 12,000 deaths caused directly by flu in the UK, many of these being elderly patients or those in high risk groups. Children are, worryingly, much more susceptible than adults to the infection. They can remain infectious for up to two weeks after being exposed to flu, even if they do not outwardly show any signs of it. 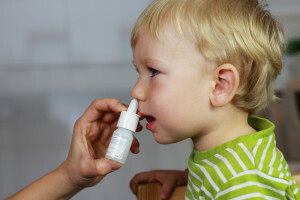 This, coupled with the fact that it can develop so rapidly into something so serious – in fact, more than 100 children died in the 2012-2013 flu season in the USA according to the Centers for Disease Control and Prevention: 90% of whom were unvaccinated and 40% were actually previously completely fit and well – makes it a very real concern for parents this winter. Flu is spread through coughing and sneezing: those packed trains, busy Christmas markets or airless offices are all danger zones. We can then become infected by breathing in the airborne droplets directly or touching the surfaces which they have landed on. Good hygiene can obviously help to reduce the spread of influenza but the fact that the infection remains live for around 24 hours on surfaces we touch every day such as money, mobile phones and door handles means it’s almost unavoidable. Children, with their pesky habit of putting their fingers in their mouth at every opportunity and their apparent natural aversion to regular hand washing, are prime candidates for picking up the infection: especially when they’re around like minded friends in schools and playgroups. Whole households have been known to be struck down in quick succession thanks to these little germ carriers. Wouldn’t it be great if there were some way to prevent the flu? There is! A flu vaccine is the most obvious way to protect ourselves; these are constantly evolving to help protect us from the four most likely strains of the flu and usually prevent half of all potential flu cases in the UK. It is recommended to have the vaccine in Autumn before the influenza season begins in earnest, as it takes a couple of weeks for it to provide full protection. Given that Australia and New Zealand have just experienced their worst flu season for several years and that the UK is now expecting the same, it makes total sense to protect ourselves and our families from this surprisingly serious infection immediately with this simple, inexpensive vaccine. Make sure you’re prepared this winter. 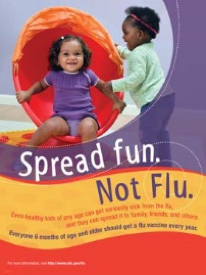 Don’t let flu get you down! This entry was posted in Blog on September 29, 2017 by tklinix.